The nicest nicety about NY so far is The Metropolitan Museum of Art. J and I went there last week for free (thanks to J’s membership at the SAM). 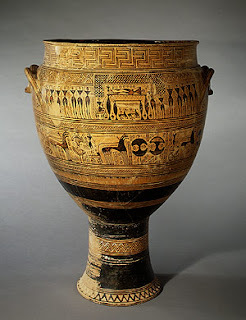 We started in the new Greek and Roman Collection, where I almost fell over when confronted with the Dipylon Krater! It was such an unexpected surprise, that I kept jumping up and down in ecstasy! I have to admit, everything after that was a little bit anticlimactic, except for perhaps the Egyptian temple (of Darfur?) that’s located in the lower level. It was interesting to see this in person, and read the text label about the different reconstructions for the work (e.g. the upturned musical paper in the lower right hand corner is completely a reconstruction). 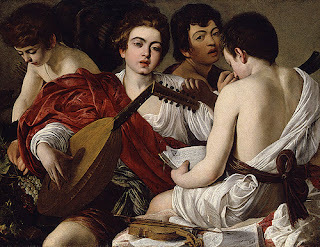 I thought a lot about connoisseurship, wondering if I would be able to tell Caravaggio’s “hand” apart from the reconstruction, without the help of a black light. Even though connoisseurship is rather looked-down upon in art history, there really is a lot of value to it. I think it would be fun to be a connoisseur of certain artists, but I don’t think that kind of expertise will ever be part of what I do (whatever that is). Connoisseurship and art mostly just reside in the world of art galleries and appraisals now. I guess there is quite a bit of connoisseurship in museum practice too, but I don’t know how much it is used by curators on a regular basis. Hmm – I’ll have to look into that. It stopped raining and now I’m free to leave the library. This blog post will have to end. Now.